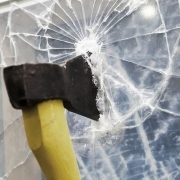 Over the past year there have been numerous reports in the press of burglars targeting businesses with smash and grab tactics to steal stock and cash. Increasingly we’ve heard of homes succumbing to this brutal form of burglary too. In an effort to make a speedy getaway, burglars are smashing through patio doors or windows to quickly grab valuable possessions, then run away. It would seem speed (not un-detection) is of key importance for them. There are a number of things homeowners can do to prevent being targeted in this way. From our many years’ experience, and having worked closely with the Police and Crime Reduction Officers, here are five practical security precautions to put in place around your home. 1 Opt for toughened glass or window film on large windows and patio doors which may be attractive to a burglar as an access point into your home. These make it harder for them to shatter the glass and create a hole/entrance to climb through. 2 Don’t leave valuables visible through your windows. Put them out of view when you’re not at home – preferably in a safe. You may find that your insurance company require you to have a safe as part of your policy’s criteria. 3 Create layers of security (like an obstacle course) around your home so it’s difficult for a burglar to quickly get in and out. Think about the security of your gate and fencing, prickly/sharp plants in vulnerable access points to your site, security lighting, CCTV, intruder alarm and sensors and safes. 4 Make it look like you’re in when you’re out. Leave a vehicle on the drive, lights on timers and ensure deliveries aren’t left in a highly visible location. Burglars are getting more sophisticated in their surveillance to plan a raid, so if you see someone acting suspiciously around your property, contact your local Police. In fact our range of Intruder Alarm Systems can now turn on lights, activate your radio or even turn on the television if the alarm is activated. 5 Invest in remote monitoring so if your alarm sensor is activated a speedy response can be initiated. This can be linked up to CCTV too so you have evidence of the intruders. All burglaries are distressing for the victims involved and smash and grab tactics add a more disturbing element. It is therefore important to try and avoid your property attracting an intruder’s attention. The more complex and involved it is to break in to, the more likely you will put a burglar off in targeting your home. 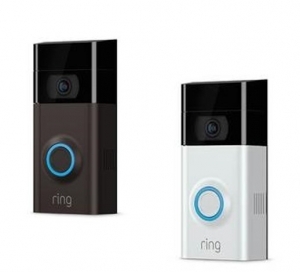 We have seen a lot of customer interest recently in Video Doorbells. These let you respond remotely to visitors at your front door, using your smartphone, tablet and PC and feature an in-built HD camera. 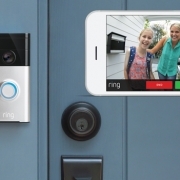 Video doorbells give you a clear view from your front door or gate, day and night and are ideal for those who want greater protection and screening from nuisance calls or for those in a property alone by themselves. They bring a reassuring layer of additional security as well as convenience. 2-way talk functionality – so you can speak to the person through the system via the built-in speakers and microphone, and without opening the door. Crystal-clear 1080HD video so you have a sharp picture of the person at your door. Instant mobile alerts and two-way talk, you can answer the door from your smartphone, tablet and PC. The system’s capability to record images – so you have a record of a visitor. Wireless technology which means you do not need wiring for the installation –you can have the device/bell on any gate or external door within your home’s WIFI range. The system runs off rechargeable batteries. A quick and easy installation. To learn more and find out our current prices for supplying and installing a video door bell in your home contact the Sales Team on tel 01483 791500.